German club Hoffenheim have announced they have signed Ryan Babel from Liverpool on a two-and-half-year deal for a fee believed to be about £6m. The 24-year-old Dutch forward joined the Reds from Ajax for £11.5m in July 2007 but failed to earn a regular first-team spot. "I am looking forward to my new mission in Hoffenheim," said Babel. "My first impressions are absolutely positive. I hope now to be able to quickly get into the team." Babel made 146 outings for Liverpool, with 81 coming as a substitute, and scored 22 goals in the process. He had been expected to remain in England after Reds boss Kenny Dalglish said on Monday that the player would not be moving. But a deal has been sorted and Hoffenheim coach Marco Pazzaiuoli told his club's website: "Ryan was on our wish list and, despite his age, he has considerable experience that will strengthen our squad." 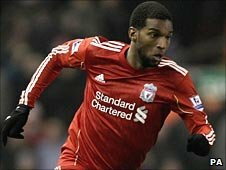 Hoffenheim manager Ernst Tanner added: "We are very proud to be able to sign in Ryan Babel an internationally experienced player from a top club like Liverpool.